Hope House Children's Trust provides children with the hope, love, care and protection that they so desperately need in times of crisis. We provide residential care within a safe and caring family environment for children who need a place to stay outside of their own families. Our speciality is providing a refuge for babies and young children who have been removed from their families in emergency or crisis situations. Some of the children who are placed with us stay only a short time before either being reunited with their families, or moving on to long-term foster care, and we do have some children in our care permanently. Based in Auckland, Hope House is affiliated with the Auckland Society of the New Church. We do care, and we know that you do too. 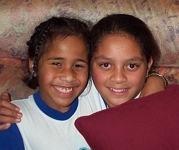 Children that come to Hope House have suffered hardships that are hard to imagine. They deserve the best we can give them. We need your support and donations. Please help us to care.